This is a research project on which a PhD student of mine is working with me. Please don’t steal the ideas and results that I discuss here. Natural examples of non-Hamiltonian systems include systems with non-holonomic constraints, or non-conservative systems (energy-losing), etc. For Hamiltonian systems, we already know a lot about their topological / geometric invariants. We want to obtain similar results for non-Hamiltonian systems. In particular, we ant to extend the known structural theorems (for example, of nondegenerate singularities) to the non-Hamiltonian case. For local problems, k and h are coprime. But when we consider the global picture (perturbations of systems on a global surface) then even the case when k and h are not coprime can be rigid ! In local problems, then only the case k=2 is rigid, the case k>=3 can be perturbed into lower multiplicities. But in global problems, even the case k > 2 can be rigid. Theorem: i) The above singularities are rigid, i.e. any small perturbation will yield the same type of singularity up to essential isomorphisms. 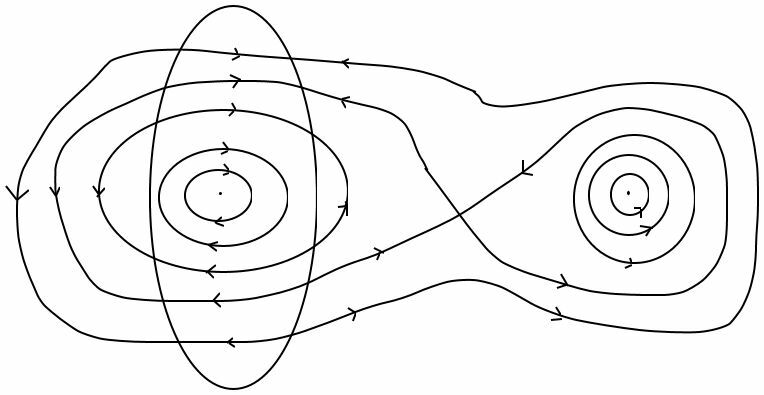 ii) Any (1,1) system can be perturbed (by an arbitrarily small perturbation) into a (1,1) system which admits only above 6 types of singularities. Remark: The above 6 types of singularities play the role analogous to Morse singularities for functions. Singularities of type 3) are actually Bott singularities. Bott singularities (of fist integrals) are a common feature of integrable system, due to commuting vector fields. b) smooth (closed) curves where dF=0. This curve may have a finite number of points where X=0 (points of type 6), the remaining points are of type 3.
c) smooth (closed curve) where X = 0. This curve have have nondegenerate (quadratic) tangencies with a non-singular level of F (points of type 5), may intersect transversally curves of dF=0 (points of type 6); the other points are of type 4. Question: how to define invariants, e.g. rank and corank, of the above 6 types of singularities ? Maybe it’s more appropriate to talk about bi-corank ? Two commuting vector fields on a compact surface. * If there is no singular point, then the surface is a torus, with constant vector fields on it. Up to essential isomorphisms, this case is rigid. * corank-1 case: X1 non-singular, X2 singular: then X2 remains singular on the orbit by X1 through the singular point, and we have a singular curve. * corank-2 case: both X1 and X2 are singular. nondegenerate corank-2 case ? Use results on intrinsic torus actions -> can arrange so that X1 = x d/dx and X2 = y d/dy (in the analytic case). Question: is it possible to have an integrable (2,0) system on a hyperbolic surface (genus greater than 1) ?